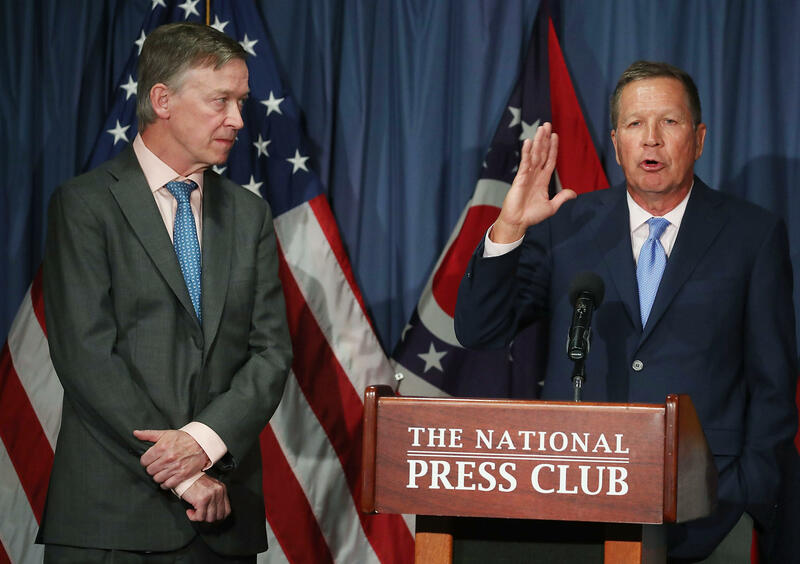 A budding friendship could be evolving into a possible run as Governors John Kasich, R-Ohio, and John Hickenlooper, D-Colorado, are reportedly eyeing a joint presidential run in 2020, according to Axios. Axios' Mike Allen wrote that Kasich would likely be at the top of such a ticket. The Republican-Democratic duo, who are reportedly referred to as "The Johns," have held several joint press interviews and events and have been making the rounds on regular Sunday talk shows, touting their ability to see beyond party lines and push Congress to work together on issues like health care and tax reform. Speaking to CBS News' John Dickerson on "Face the Nation", Kasich said the duo's rare friendship speaks to positive impacts of reaching across the partisan divide to get work done. "I think that's what's missing in Washington right now. You know, John and I are not hung up about who wins, who loses, who gets credit, who doesn't because as a governor you can't spend a lot of time doing that, said Kasich. He added, "The American people want things to function. And they can function. If you don't worry about which party gets the credit or which politician gets the credit, it can work." According to Axios' reporting, the two are planing to extend their joint platform to policy areas like immigration and job creation. But both of them have dispelled the notion of a "unity ticket" to challenge President Donald Trump. Hickenlooper told the Denver Post, "It's fun to talk about, but it's not in the cards." "We're in a two-party system, and that kind of a campaign generally distracts. It's symbolic, and I can understand the point of that," he added. Kasich said in an interview with CNN's Jake Tapper that he had "no plans to do anything" like challenge Mr. Trump, and instead says he's "rooting" for the president to "get it together." The two sitting governors would both bring years of experience on the state level and policy work to the White House if their rumored run turned into a reality. Kasich, who served nine terms in the House, has been in his role as governor of Ohio since 2010. While Hickenlooper, who is term-limited and will leave office in 2018, has evolved from businessman to politician -- serving two terms as Denver's mayor and has been Colorado's governor since 2011. This would be Kasich's second stab at a presidential race since the 2016 campaign. CBS News' John Bat contributed to this report.